Did Concentration Camps Achieve their Goals? World War II was a time when many countries were at war with each other. The United States, Soviet Union, Britain, and France made up the Allied Powers. Germany, Italy, and Japan made up the Central Powers. One important event that happened during WWII was the Holocaust. 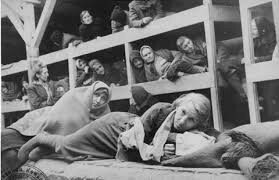 This was a time when the Jewish were captured by the Germans and brought to concentration camps to get killed and forced to do labor. In some ways, concentration camps did achieve their goals, but there was some cases where the Jewish challenged the success of the camps. Concentration Camps were made to capture the Jewish. Hitler believed that the Aryan race was superior and the Jewish race was inferior. Did you know that Adolf Hitler was part Jewish? This poses the question as to why he hated the Jews. Hitler convinced all of Germany to hate the Jews, which is antisemitism. The Germans had the right to incarcerate people as long as it was for protective or preventive reasoning. The Germans were allowed to capture the Jewish because they believed that they were protecting the world from a disgusting group of people. The Jewish had to carry out difficult work when in concentration camps. The Jews had many back breaking jobs such as working in factories and building more concentration camps. However, prisoners of higher status would have more practical jobs that would not harm them physically. Lower status people such as the Jewish would work in the factories. Jews were forced to horrible fates. Concentration camps housed horrible living conditions. Prisoners were given three meals a day. That may seem reasonable, but there was barely any food on the plate, so they often starved to death. This was the first of many fates. In addition to the lack of food, the barracks were dirty, small, and overcrowded. Germans were testing machines called gas chambers. 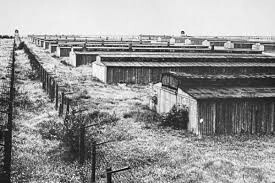 The Germans wanted to use gas chambers for the purpose of mass murdering the Jewish population. 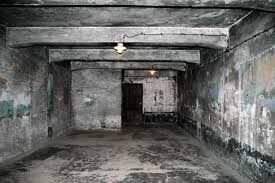 If you didn't know, a gas chamber is a small room that gets filled up with poisonous gas. Anyone inside these chambers would inhale the gas and die. The Jewish prisoners were excluded from daily life. When the Jews were captured, they could no longer participate in activities such as art, music, and science. Children could no longer learn at schools. 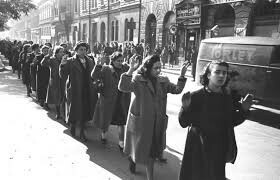 They were forced to leave their homes due to German legislation. The Jews were forced to start a new life in the concentration camps that would eventually lead to their downfall. Some Jews were able to slip away from capture. 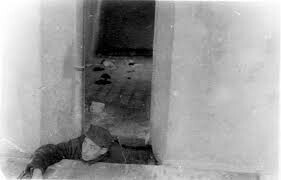 Many citizens hid Jews in their homes so that they did not get captured. This was a very dangerous thing to do because if you were caught with Jews in your home, you would be sentenced to death. One family that hid two Jewish girls was the Kowalski family. However, their not-so-kind neighbor got suspicious and reported the Kowalskis to the Nazis. They were discovered and were burnt to death in their barn. Children and adults in hiding faced many hardships. Many Jews got false identities so that they could live freely without capture. False identities were hard to get because they were living in a German-led continent. For the children that were too Jewish-looking, as some called it, they had to hide somewhere. Anne Frank lived in hiding for a very long time. Anne Frank lived in a small building with seven other Jews to escape capture. They did not go outside for two years. 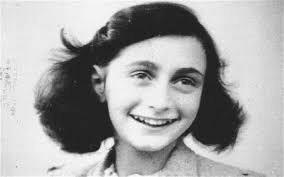 Since Anne Frank always had to be quiet, she was frustrated a lot, so she started to write a diary with hopes that it would be published someday. "Anne Frank's History." Anne Frank Website. N.p., n.d. Web. 1 Mar. 2016. "Concentration Camps." USHMM. N.p., n.d. Web. 4 Mar. 2016. "Daily Life in Concentration Camps." USHMM. N.p., n.d. Web. 2 Mar. 2016. "Gassing Operations." USHMM. N.p., n.d. Web. 4 Mar. 2016. "Hidden Children: Hardships." Ushmm. N.p., n.d. Web. 2 Mar. 2016. "Holocaust Hiding Place." Algemeiner. N.p., n.d. Web. 2 Mar. 2016. "Holocaust - Historical Overview." Knesset. N.p., n.d. Web. 1 Mar. 2016. "Living Conditions." Jewish Virtual Library. N.p., n.d. Web. 2 Mar. 2016. "Why Did Hitler Hate the Jews." Anne Frank Website. N.p., n.d. Web. 4 Mar. 2016.